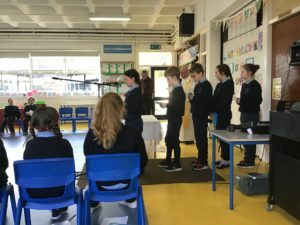 Scoil Mhuire is a Catholic school under the Patronage of the Catholic Bishop of Ferns. 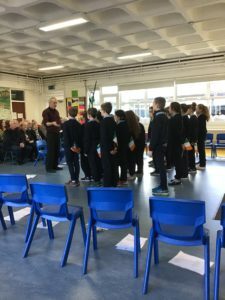 Scoil Mhuire is situated in the townsland of Ballinamona, Campile, Co. Wexford, on the New Ross – Campile road. It is a central school for the Parish of Sutton’s, which is divided into Horeswood and Ballykelly Curacies. In 1979 four schools in the parish amalgamated into Scoil Mhuire. These four schools were Aclare NS, Ballykelly NS, Horeswood NS, and Killesk NS. 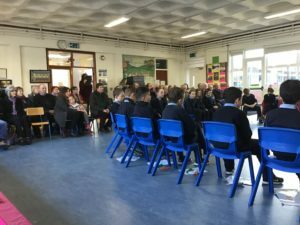 Scoil Mhuire has 11 mainstream teachers and four special education teachers. There are five SNA’s in the school. We have a cleaner, caretaker and secretary. Due to a number of reported cases of Scarlet Fever in the school please find some information on it in the link below. Please remember that Scarlet Fever is very contagious and parents need to be vigilant. 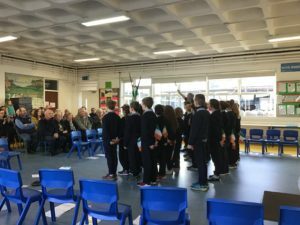 Grandparents Day took place in Scoil Mhuire on Wednesday, January 30th. 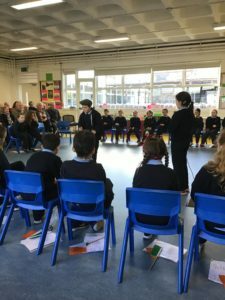 Third and Fourth Class hosted Grandparents Day in our school this year. 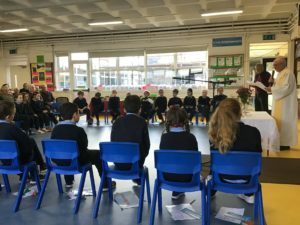 The children took part in a prayer service to mark Catholic Schools Week which was led by Fr. O’Leary. They also performed songs and danced for the visiting grandparents. They acted out games from the past and they also presented their grandparents with a little gift. It was a lovely morning and we were delighted to welcome all Grandparents to our school. Many thanks to Mr. Crowley and Kathleen for all their hard work in preparation for the day. 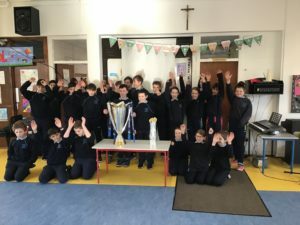 Brendan Holohan from Leinster Rugby visited our school recently with the European Champions Cup and the PRO 14 silverware. 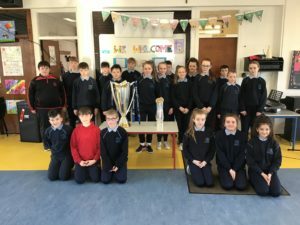 Children in the school got to look at the trophies and Brendan told them all about them. 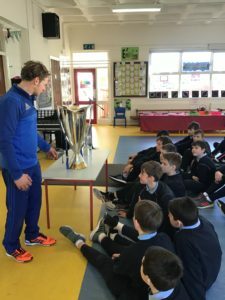 Many thanks to Leinster Rugby for arranging the visit. Applications for enrolment are now being accepted for the 2019/2020 school year. Please contact the school office on 051-388255 or horeswoodns@gmail.com for an enrolment pack. You can also call to the school to pick one up. Please follow the link below to access the school calendar for this school year. Keep up to date with whats happening in Scoil Mhuire, Horeswood by following the latest news on our Twitter page! !